A 22-year-old female presented with the complaint of vaginal bleeding 1 week after a positive pregnancy test. 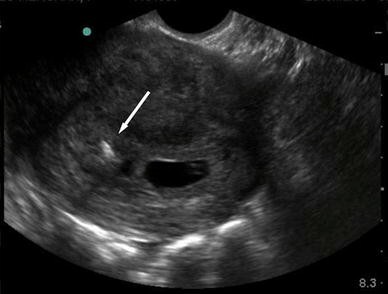 An emergency department bedside transvaginal ultrasound revealed an early intrauterine pregnancy (IUP) in the presence of an intrauterine device (IUD). While a rare event, pregnancy can occur in the presence of an IUD. The emergency physician should be aware of the complications of this obstetrical condition. A 22-year-old female presented to the emergency department (ED) with the complaint of vaginal bleeding. One week prior, the patient had seen her primary provider after she missed her period. She had a positive urine pregnancy test (UPT) at that time. This was a surprise to the patient as she had a mechanical copper intrauterine device (IUD) in place for the past several years. A pelvic exam was done at that office visit, and the physician could not visualize the strings of her IUD in the cervical os. She was advised to follow up closely with her OB/Gyn provider for an ultrasound to determine the location of the IUD, but presented to the ED before that appointment due to a small amount of vaginal bleeding. 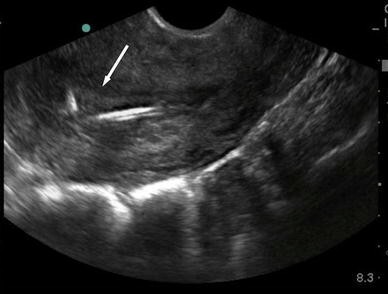 As part of her ED evaluation for a possible ectopic pregnancy, a bedside transvaginal ultrasound was performed by the emergency physician, which revealed the rare finding of an intrauterine pregnancy with an IUD in place. The gestational sac was located high in the uterine fundus with a crown-rump length (CRL) consistent with a gestational age of 6 weeks and fetal cardiac activity in the 130 s (Figs. 1, 2). The patient was discharged home and followed up with her OB/Gyn provider 1 week later. At that visit, the decision was made to leave the IUD in place for the remainder of the pregnancy. At the time of this report, the patient’s vaginal bleeding had stopped and her pregnancy was continuing. It has been estimated that pregnancy occurs approximately 2% of the time with an IUD in place . According to some studies, more than of 50% of these pregnancies end in spontaneous abortion . These pregnancies are also at a much higher risk of adverse outcomes including premature rupture of membranes (PROM), placental abruption, placental previa, preterm delivery, Apgar scores <7 at 5 min, low birthweight, congenital malformation, and chorioamnionitis . Several studies have been performed to investigate if an IUD should be removed or left in place when pregnancy occurs. Recommendations favor removal of the IUD if the string is visible and the device can easily be removed through the cervix; however; this is a high-risk obstetrical decision and one best made by the patient’s OB/Gyn provider .